I used to love walking and walked mostly in the evenings with my daughter, which I used to thoroughly enjoy. We’d generally walk between 5 to 6K each evening but I began to notice that the day following a walk I would have pain in my ankle, knee and lower back. As you can imagine, after an 18 hole game of golf the same symptoms would arise, but much worse! Then my daughter gave me a Christmas present of a voucher for Foot Solutions. 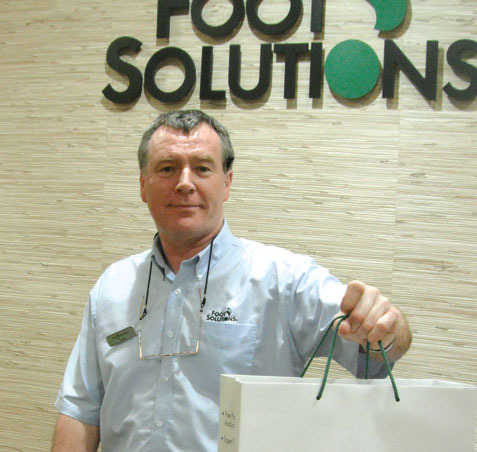 I went into Foot Solutions in Stillorgan Shopping Centre where Blanaid, one of their trained consultants, carried out a Full Foot and Gait Analysis and quickly identified what the problem was. She noticed that my feet were out of alignment and that my ankles were rolling in so she scanned me for a pair of custom made Arch Supports. Blanaid also took great care in measuring my feet and fitted me with the correct shoes. She introduced me to “Stretch Walkers”, which I must say, together with the custom made Arch Supports and extra cushion socks, have greatly helped to get me back out walking again. In fact I completed a 12 MILE walk a short while ago which I am delighted about. The pain in my ankle, knee and lower back is much improved, so much so that I also took part in the sponsored walk for “Aware” from Harbour to Harbour (Howth to Dun Laoghaire) on St.Patrick’s Day. We covered the distance of 16 miles in 4 hours and a few minutes. I wore my Stretch Walkers and my feet felt quite comfortable throughout the walk. Together with the Custom Arch Supports they do provide great support and I did not have the usual aches in my knees and lower back, which I have experienced after other walks before this. Naturally I felt tired on the following day but this lasted only for a day. I can honestly say that if I hadn’t paid that visit to Foot Solutions I could not have contemplated such a walk! I am also happy to say that I am out playing my much loved game of golf again and definitely not experiencing the same level of discomfort as before. Happy days! In short, I think anybody suffering with pain and discomfort as I was should definitely pay a visit to their nearest Foot Solutions store.